Yes, I'm a curmudgeonly, hopelessly out-of-date fuddy-duddy. Perhaps in the top 1% of the fuddiest of fuddy duddies. That's probably why I see a correlation between a recruiting ad the USMC is running and declining birth rates in the US. If you didn't know, the birth rate in the US declined last year to just about the lowest ever. If you further didn't know, births happen because a man and woman love each other very much and have a "dance" and then the woman gets big and the stork brings a baby and then the woman gets smaller. At least that's what I told my kids between shots of bourbon, sitting on my front porch. We don't seem to have pondered what might happen if we spend 30 years telling young 'uns that there are 37 genders, all family structures are equal, women should pursue a career above all else, marriage is slavery to the patriarchy and men are toxic. If you think that's an exaggeration, watch this ad where young ladies are encouraged to play rugby and then join the Marine Corps infantry. The Marine Corps infantry. Never mind the fact that we have established that infantry units with women have higher casualty rates. Meaning there are mothers, wives and kids who have gotten "We regret to inform you..." letters because we want women in the infantry for some reason. But I digress. The Marines are the peak of manhood. There is nothing above that. The Marine infantry is the peak of the peak. We are now so totally confused about where babies come from that we think it's a good idea to run multi-million dollar advertising campaigns to encourage women to aspire to being the manliest of men. Meanwhile, the NCAA has punished states that think women's restrooms should be used only by women, but I digress again. And I could digress again a thousand times over, but I want to get to my chores today, so I won't. Anyway, there were dozens of thumb-sucking head-scratchers published this week offering up reasons why women aren't having babies. They all miss the basic reason. We told girls not to. And for good reason! 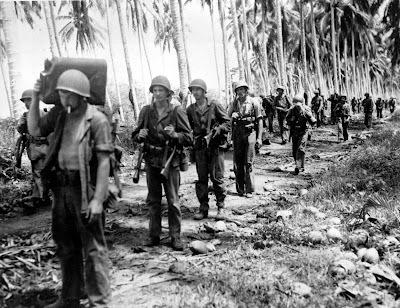 Here we see a platoon of Marine Corps infantry wandering around, lost in the jungle, because they wouldn't ask for directions. If there had been lots of women Marines on Guadalcanal, the battle would have been won in no time at all. They're not worried about there not being many kids right now. The noise-makers are still expecting to be able to pull in other people's kids...not realizing that the birth rates are dropping elsewhere, too. They won't freak out until things are seriously jacked up for them, and it can't be denied it's a lack of kids. Then they'll do a full 180 to some really bad idea for getting more kids...probably demanding that women be paid for each kid or something. Funny thing is? You're quite right about the "told girls not to"-- all through school, I was beaten over the head with the idea that if you had a kid, your life is over. "fertility is a female flaw" - What a genius phrasing. Thanks for sharing that. Not being a woman, I never saw that before, but it makes perfect sense. I can't really claim it, I wouldn't have even recognized the issue if Darwin hadn't pointed out it's...well, screwy. Once he pointed it out, it clicked: the thing is usually set up as all the woman's fault, and responsibility.